It's Christmas 2007, and I am visiting extended family in St. Louis, my beloved boyhood home. Missouri is the "Show Me" state, so it's a fitting setting to ask how much money have real estate consumers really saved since McKinsey & Company predicted that industry restructuring could deliver $30 billion in annual savings ten years ago? Last week, BusinessWeek's real estate blog, Hot Property, reported that home buyers and sellers paid $55 billion in commissions in 2007, down $13 billion from the peak in 2005. They attributed the decline to falling sales and noted that consumers paid $19 Billion more than 2000 "largely because of the surge in home prices during the boom." ChangeAgents's goal is to create a voluntary coalition of money-saving real estate business models and to invite their clients to share fraction of their e-commerce savings with local, national, and international causes of their own choice. Here's one example of a "community commission." If you're part of the new generation of real estate companies delivering billions in savings, or if you're hoping to sell "for sale by owner" or receive a real estate rebate check in 2008, would you like to join our conversation about ePhilanthropy & Cause Marketing in real estate? All Saints' Day debate: Should sellers bury St. Joseph statues? Earlier this week, a friend sent an article from the Wall Street Journal about burying St. Joseph statues entitled, "When It Takes a Miracle To Sell Your House." 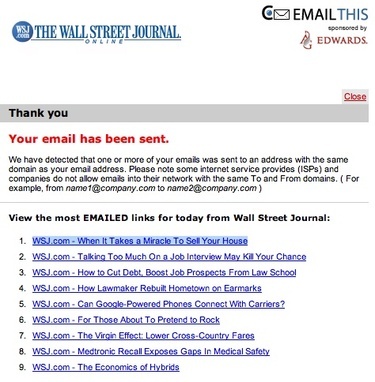 As show in the image above, the story was the MOST EMAILED link on the Wall Street Journal, five rankings ahead of Google's new G-Phone. Amazing, and amazingly misguided IMHO. Over the past few years, I've blogged repeatedly about the practice (click on "Continue reading" below for links). In 1998, my initial objections were stated in a well-researched article, which journalists may find worth reading, entitled, "Beyond Superstition: Doing Justice to the 'Just Man'." Nearly a decade later, I created an interactive map called "St. Joe 2.0: Geography of Faith" where anyone who believed in the practice could document their prayer experiences to St. Joseph and others could propose alternative spiritual practices. Then after a Catholic conference on Social Justice was canceled in Boston for lack of interest, my blog posts became more pointed: "Social Justice for Real Estate Dummies." Unlike NPR's Talk of the Nation which kicked off their program "Selling Your Soul to Sell Your House" with an interview about St. Joseph, the Wall Street Journal told their audience that some Catholics are offended by the practice of burying St. Joseph statues upside down because they believe it is superstitious. Some Catholic bookstores objective to selling the statues for the same reason. Looks like the WSJ blog post is generating some heated discussion. I'd love to invite anyone who wants to take a more positive approach towards "reinventing" this misguided devotion to St. Joseph to consider our fund raising campaign for AIDS orphans or to propose their own ideas to the honor patron saint of the Catholic church and Social Justice. Isn't it time sellers, real estate agents, and the press do justice to the "just man"? Your comments are most welcome here or on our wiki. 8/23/05: Leading indicators: Do sales of St. Joseph statues signal a housing slide? 10/28/05: Realtors' "Anti-bubble reports" out of sync with emerging buyers' market?